NETWORK FINALS: THE VOICE gained 0.1 in final numbers, but CHICAGO FIRE lost the same. CABLE HIGHLIGHTS: FX’s THE PEOPLE V. OJ SIMPSON closed strongly, up 0.23 for a 1.34 finale. That more than doubled the night’s next-highest original, Discovery’s THE DEADLIEST CATCH, which fell 0.11 to 0.76, with a related lead-out special at 0.60. ESPN’s coverage of the WOMEN’S NCAA CHAMPIONSHIP GAME wasn’t at the level of Monday night’s male game, but still hit the Top 10 at 0.69. That tied it with TNT’s NBA Golden State vs. Minnesota game, while the Detroit vs. Miami game was at 0.35. Bravo’s REAL HOUSEWIVES OF BEVERLY HILLS dipped 0.04 to 0.67. USA’s CHRISLEY KNOWS BEST lost 0.02 to 0.58. On Spike, INK MASTER ticked down to 0.56, and the REDEMPTION lead-out was also down a hundredth to 0.34. OWN’s IF LOVING YOU IS WRONG dropped 0.02 to 0.55. On Lifetime, DANCE MOMS was steady at 0.53. On Comedy Central, TOSH.0 fell 0.07 to 0.44, and NOT SAFE WITH NIKKI GLASER held at 0.26. Food Network’s CHOPPED CHAMPIONS was at 0.40. On TLC, JILL & JESSA was down 0.02 to 0.38, and THE WILLIS FAMILY was up 0.02 to 0.20. History’s FORGED IN FIRE lost 0.04 to 0.37, followed by IRON & FIRE at 0.25. A BET BLACK GIRLS ROCK! special was at 0.35 (plus 0.01/30K from a Centric simulcast), and lead-out CHASING DESTINY was at 0.31. On E!, TOTAL DIVAS climbed 0.07 to 0.33, and LA CLIPPERS DANCE SQUAD rose 0.05 to 0.18. A&E’s STORAGE WARS was at 0.33/0.32. WGNAmerica’s OUTSIDERS grew by 0.05 to 0.32. On Freeform, the season finale of SHADOWHUNTERS dropped 0.02 to 0.30, and STITCHERS fell more sharply, down 0.07 to 0.11. Also heavily down was HGTV’s GOOD BONES, airing without a FIXER UPPER lead-in and down an alarming 0.25 to 0.30. On MTV, AWKWARD gained 0.03 to 0.28, and FAKING IT was steady at 0.19. 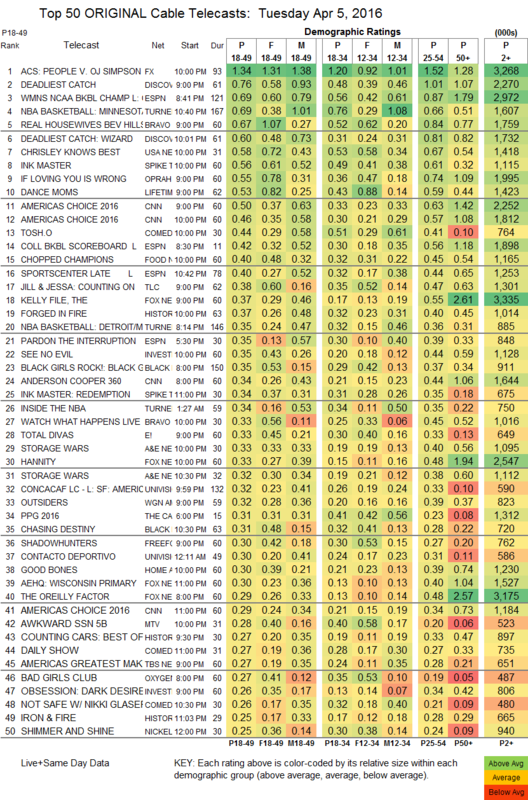 TBS’s AMERICA’S GREATEST MAKERS was at 0.27, but SEPARATION ANXIETY plunged 0.22 to 0.16. 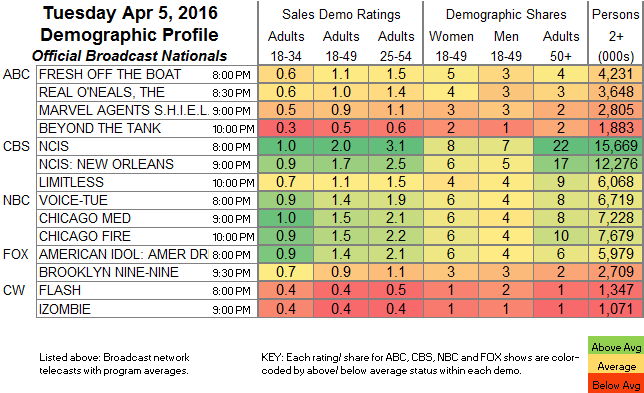 POP’s IMPACT WRESTLING fell 0.02 to 0.08, with the re-airing down 0.01 to 0.02/66K.